Ali Amjad’s Tower Clock of Chadnighat located in Sylhet City is one of the popular attractions, oldest splendid – looking love tower situated on the northern bank of the Surma River (west to Circuit House) at Chadnighat in Sylhet City in Bangladesh. Famous Keane Bridge lies to the east beside the Tower Clock. According to history, the tower was built in 1872 by Ali Amjad’s Father. It was dedicated to Nawab Ali Amjad Khan. One can plan to visit both the attractions at a time. People enjoy the beauty of Ali Amjad’s Tower Clock in the evening with the beauty of Sylhet beside Surma River that adds an additional beauty to Sylhet City. Some tower clocks are famous landmarks in the globe. Big Ben in London, Spasskaya tower of Kremlin in Moscow, Royal Makkah Clock Tower in Saudi Arabia which is the largest tower clock in the world, and Tower of Winds which is the oldest tower clock in Athens in Greece are some of them. Many people have no idea about the brief story of the oldest tower clock in Bangladesh. Ali Amjad Khan’s Tower Clock is the first and oldest tower clock in Bangladesh, a pride of Sylhet. At present this tower clock is a great attraction for tourists. The tower clock area is the most significant recreational spot in Sylhet city. The visitors tend to express curiosity to know how the big clock is functioning. The tower, adjacent to another historical site, Kean Bridge, over the Surma River has also added to the beauty of Sylhet city. This clock has a charming function that it can ring the bell each hour. The sound of this bell is heard from the whole city area if the city environment stays calm and quite. When there was no watch in whole Sylhet, Ali Amjad’s Clock Tower was the only medium for knowing the time of a day in the city area. From a far distance, Ali Amjad’s Tower Clock may seem like a Church for its structural pattern. Many people think that Ali Amjad Khan, a Nawab of Prithimpassa, built this tower clock. But nobody could find out exactly when the clock has started ticking. According to the Nawab’s family tree, the clock was presented by Ali Amjad’s father, Nawab Ali Ahmed Khan, which was later constructed in around 1895. Another source said, Ali Amjad was invited to visit Delhi and thereby was charmed by the clock made with the inspiration of the princess of Delhi. He also craved to build the same and eventually made the tower clock with a similar design and pattern in Sylhet. During the War of Liberation in 1971, this ancient clock tower was dispersed by bullets of Pak Occupation Army. 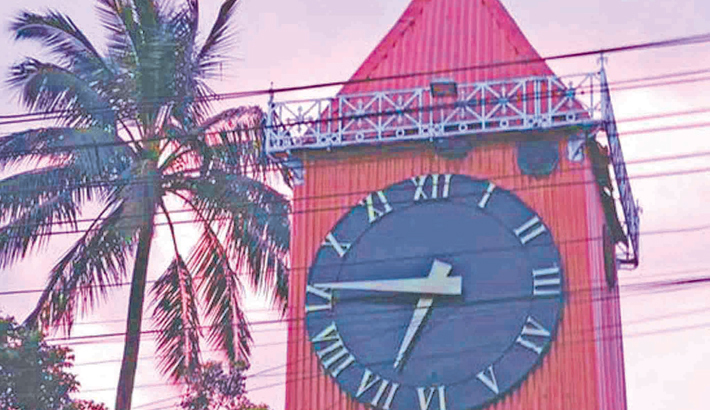 After Independence, the clock was repaired by Sylhet City Municipality that made it active. But the clock was stopped soon after. In 1987, Ali Amjad’s Clock was repaired and restored by a technician of a company in Dhaka. After launching the clock was provided with a remote controller to wind the clock. Within a short time the clock stopped again. In 2011, the Sylhet City Corporation repaired the tower clock again; then it came into operation 24 hours a day. People arrive here to see the tower clock from far flung places all over the country. But the clock recently has become inactive. The clock is worn out repeatedly due to lack of proper repair work done with the help of modern technology.